About 42 kms of driving down the East Coast Road from Chennai, 16 kms short of Mamallapuram, we branch off to the right through a multicolored arch. A concrete road ends abruptly in front of a 15th century stone mahamantapam. Each of the 16 pillars in the mahamantapam is intricately carved. The dasavatharam or ten incarnations of Lord Vishnu are very easily recognizable among the numerous figures. Beyond the mahamantapam is the temple. Entering the outer praakaram or courtyard, we hear a melodious tinkling pervading the atmosphere. Looking around we find that the bells are not around the neck of a temple elephant as expected, but are hung on top of an immensely tall and beautiful Dhwaja Sthamba in burnished copper. In 1910, the archeological department found stone carvings dating back to 1115 AD. Kulottunga Chola, in his 45th year of reign, had recorded information pertaining to gifts and endowments made to the temple by the Chola kings. The present temple structure dates back to 10th – 11th Centuries. The main sanctum sanctorum is dedicated to Adivaraha – the Varaha (boar) Avatar of Lord Vishnu. 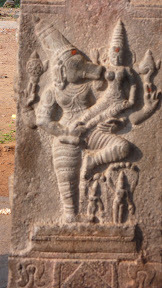 The main consort is AkhilaValli. 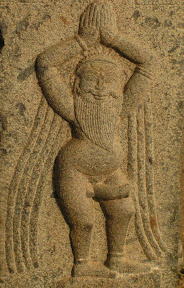 The deity, standing with his face turned to the east, has his right leg on the ground. His left leg is on Adisesha’s (the snake) head. With his consort, AkhilaValli on his left lap, he is teaching the Charma Shloka. The Utsavamoorthy, the deity taken around in procession, is known as Nitya Kalyana Perumal. Legend has it that one Galavamuni offered his 360 daughters to Lord Vishnu in marriage. The Lord appeared as a Brahmachari of the Kasyapa Gotram and married one of them each day. On the last day, he appeared as Varaha and combined them into one consort, Akhilavallinachiyar, and kept her on his left side. A shrine inside the temple is dedicated to KomalaValli, the first bride. During the Utsavam, the lord is accompanied by Sridevi and Bhoodevi. Young men and women seeking spouses bring garlands to this temple, pray to the lord and wearing the garlands circumambulate the main shrine 9 times. Once their prayer is fulfilled and they are married, they return to give thanks. Couples also worship this God so that the Rahu Ketu doshas be removed. Nitya Kalyana Perumal and KomalaValli both have the drishti bottu, beauty spot. Prayers to these deities, it is believed, will remove drishti – the evil eye. Shrines devoted to Garuda, Lord Rangantha, Vinayaka, etc. are also a part of the temple complex. Next to the temple are two temple tanks – Varaha Teertham and Kalyana Teertham. During the month of Maasi, if one bathes in the Varaha Teertham and worships the Lord he will attain Moksha. During the month of Chitrai, if one bathes in Kalyana Teertham and worships the Lord his sins will be washed away. Thirumangai Alwar (8th Century AD) has composed 10 stanzas in praise of the Lord. These are inscribed on a slab of granite on the temple wall. On his last visit to India, the late litterateur A.K.Ramanujan, translated this composition into English, right there in the temple premises. It is a part of his unpublished works. The song talks of a mother who describes her daughter’s frenzied passion for the Lord of Itaventai. A temple steeped in history, poetry and myths, it is a place of romance and beauty. Coincidentally we visited this temple on the day dedicated to lovers world over – 14th February! That it is located off the East Coast Road, a dream drive, is just the final touch of divinity! This entry was posted in Travel and tagged India Travel, tamil Nadu temples, Tiruvidanthai, Vishnu Avatar Varaha on April 14, 2008 by vpdot.